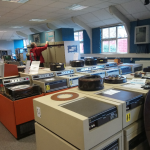 Yesterday, Harry and I visited the National Museum of Computing, in Bletchley Park. I was in nerd heaven, I tell you! Firstly, we saw the Bombe: developed by Alan Turing and Gordon Welchman during WW2. I did my best to explain to Harry, the principle behind its workings. I don’t think my explanation (with my limited knowledge) was much good, but he seemed to get the idea. 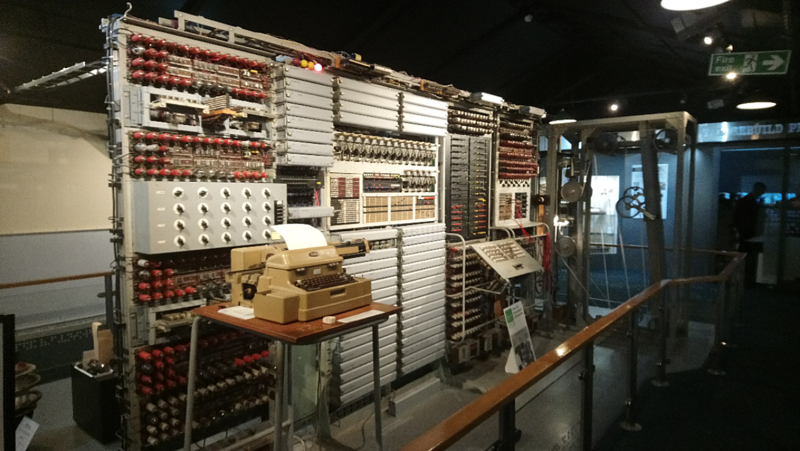 Then we saw Colossus: the world’s first programmable computer. 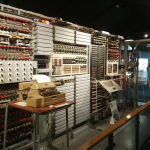 Built to decode messages from the Lorenz machine that was used to encode German High Command messages (named Tunny by the British codebreakers). 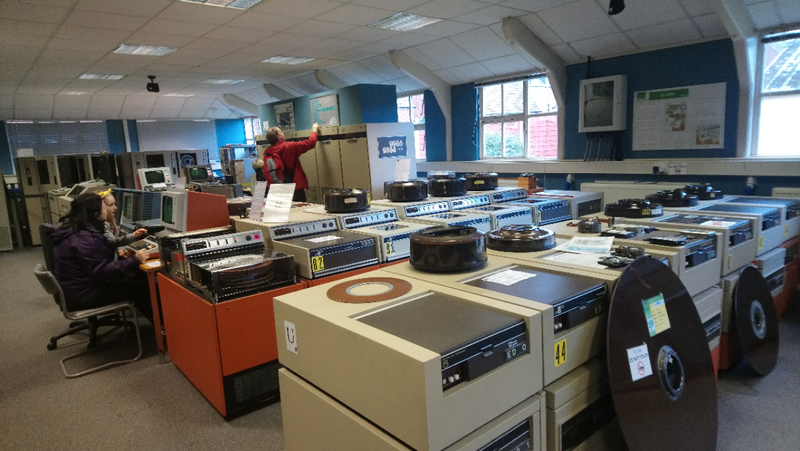 In the Mainframe room we were astonished at the size of the machines. Hard drives the size of refridgerators filled the room, each with a capacity smaller than today’s memory sticks! That big circular disk bottom right… I think that was 8K or something stupid like that. A lot of it was made by ICL – International Computers Limited – a British computer company from way back, that I’d completely forgotten about. This is a piece of memory – core memory, as it was known. Look at the size of it! 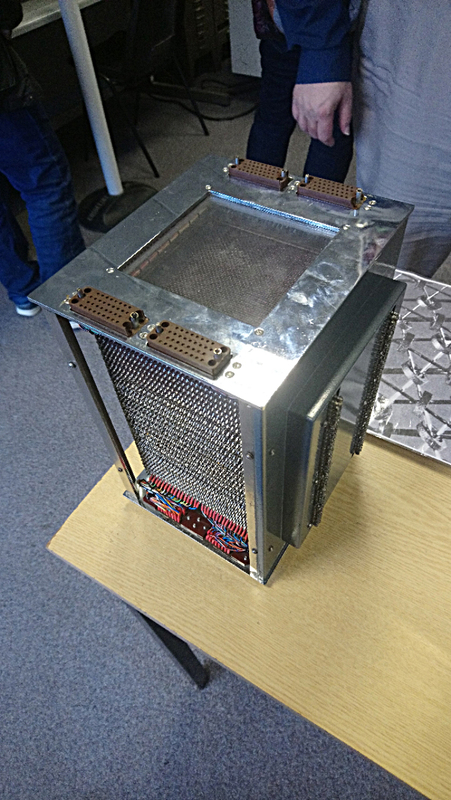 And this wasn’t a prototype or anything, this was actually in use back in the day, plugged into mainframe computers. Consisting of just 20K of memory: about 400,000 times less than the memory in a modern, cheap mobile phone. And each tiny little core was threaded onto the wires by hand. Jeez. We then played the original version of Mario Kart on an old Atari. With it’s blocky 8-bit graphics and unusual controller, I thought I might be able to beat him. But, he thrashed me. As usual. It was a great way to spend a few hours though and we both thoroughly enjoyed it. Well, I know Harry enjoyed it, but for me, well, I was in nostalgic nirvana. How things change in a week. Not one mention of food. A company I worked for many years ago in Harpenden had robot paint sprayers and in the office were a pair of very similar hard drives. If I lived more local to Bletchley it would be on my list of places to visit. The ZX81 was a must have black box just to punish yourself spending ages typing a program in just to find there was a misprint. Not only that, but I had the famous 16K wobbly RAM pack plugged into the back of mine. The slightest of knocks and the hours of typing on that crappy keyboard were lost in an instant! Yep. Many a time spent with rampack wobble. Those the days……. Or perhaps I was 79. Anyway. I want to go. You’re going to have to take me. It sounds excellent and aces and also a place I’d like to visit. Please!! Well, you’re a grown man (I think), so you can probably take yourself, Bren. However, I’d be happy to meet up with you there sometime, if you want. Watch out Bren, Mr Masher is after a free cuppa. Just re-read this. 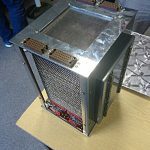 I worked on an ICL computer in 500 BC. It was an ICL System 4 (actually the 4/72, to be precise), at RAF Hendon. We taught it to play Christmas Carols. Your tax £s hard at work there kids.